All signs are pointing to multinational support services company, Interserve securing the £11.5m contract to carry out the long-awaited revamp of Rotherham Interchange. Plans were approved last year which focused on refreshing the concourses with upgrades to flooring, plinths and glazing. The main pedestrian entrances are also set to be revamped. Partners decided to focus on refurbishing the car park and bus station rather than a large scale redevelopment. Opened in 1971, the multi storey car park has since developed widespread defects. It is underutilised and "nearing the point of being beyond economic repair." 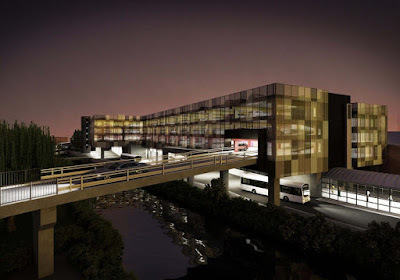 Led by the South Yorkshire Passenger Transport Executive (SYPTE), which holds a lease agreement with owners Norseman Estates Limited to maintain and operate the interchange and car park above, began the tender process to procure a construction firm to carry out the work at the end of 2017. The tender involves works to the car park and bus station. The car park works will involve soffit tie repairs, deck repairs, concrete repairs to structural beams and columns and waterproofing. The car park will benefit from new surfacing, bigger spaces for modern cars, designated walking routes and new cladding. The bus station works includes the upgrade of the fixtures and finishes, including a comprehensive review and refurbishment of the waiting areas, boarding points, customer service desks and information hubs to respond to opportunities offered by modern passenger information display systems and web-enabled information technology. The Sheffield City Region Combined Authority (CA) is set to borrow £12.5m so that refurbishment of the important town centre asset can be carried out. 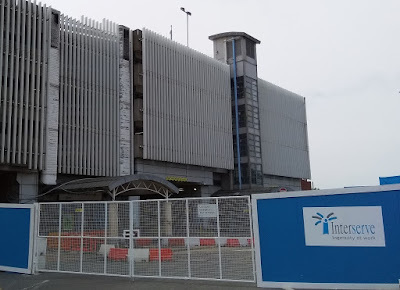 Construction work was programmed to start on Monday April 30 and the interchange has been wrapped in Interserve hoardings whilst company cabins were moved on site. The café, shops and customer toilets will remain open whilst bus services use the temporary facility at Forge Island. Ben Gilligan, director of public transport at SYPTE, said: "Having a temporary bus station means the building contractors will be able to work intensively on the interchange. The project is on track to be delivered by Spring 2019, as planned." Cllr. Denise Lelliott, cabinet member for jobs and the local economy, said the work was an exciting development for Rotherham town centre. She said: "The new interchange is a key part of our plans to regenerate the area, as part of the town centre masterplan, and promoting sustainable transport is an important element of this." Interserve is currently completing the construction of the £150m Templeborough Biomass Power Plant in Rotherham where the first wood firing recently took place. The company recently announced its financial results for the year ended December 31 2017 which showed it had revenues of £3.25 billion but pre-tax losses had widened to £244m from £91.1m in the previous year. The company has over £500m of debt and put in place a transformation plan in October. Interserve is exiting the sector based around the construction of Energy from Waste (EfW) facilities such as Templeborough.